Your printer/computer may display an ink alert message, such as “non-genuine cartridge” following HP 363 or 363XL cartridge installation. Press proceed/continue/accept/yes/OK to dismiss this prompt. If any streaks or missing colors appear on prints, initiate a “Clean Printhead” procedure, via the printer/computer cartridge maintenance menu. If an “Unrecognized cartridge”, “Cartridge problem” or “Missing or Damaged” message appears, remove the cartridge and verify the cartridge is in the correct slot and is installed right side up with the green circuit board (chip) on the right side of the cartridge. Also inspect the cartridge’s smart chip contacts to ensure the electrical contacts are clean. 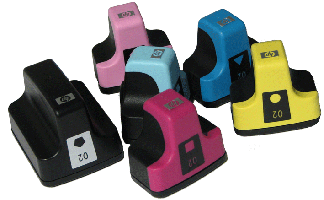 If an “Unrecognized cartridge”, “Cartridge problem” or “Expired ink” message continues to be observed, return the cartridge to your ink refiller to have the cartridge re-programmed and weighed. 1) Assuming the cartridge chip has been replaced/reprogrammed, then this ink level alert may be a printer defect and not a cartridge issue. 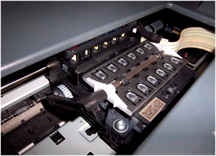 2) Reset the printer by unplugging the power cable from the back of printer. Hold down number 9 & # key, plug in the power and turn the printer on. Printer will reset it self. 3) Follow the instruction from printer LCD to complete the start up routine. This is a one time reset for this printer. 4) Refer to advanced printer diagnostics below. 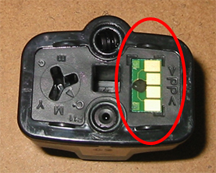 *The permanent built-in electronic PRINTHEAD (pictured below), which the ink cartridges plug into within the carriage, is responsible for pulling ink from the 6 ink cartridges and fires ink drops onto the page, will eventually fail over time (maximum rated life is 41,000 pages, but average customer life expectancy is approximately 16,000 pages). This is primarily based on a combination of total printed pages (rated duty cycle) vs. image content and printing frequency. Dry firing, where one particular color is not printing, can significantly increase the chances of a permanent printhead failure. The built-in PRINTHEAD will eventually fail over time with usage and age (not replaceable).